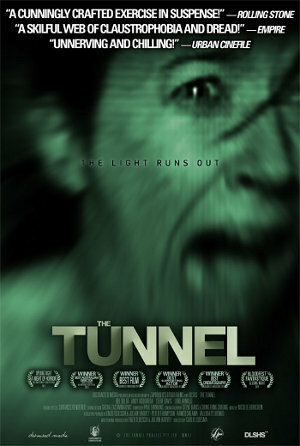 The movie I happened to watch last night was THE TUNNEL� This 2011 movie is an Australian Mock-documentary using found-footage , I liken it to Blair Witch Project meets C.H.U.D. If some of you haven't heard of C.H.U.D. or even heard the name screamed in fear by Homer Simpson, look it up. Before I review this film I want to tell you some interesting info about the making of the film. This is the first film to be funded by something called The 135k Project a frame-selling, crowd funded, free internet release created by the company Distracted Media. They are trying to make movies that aren't constrained to studios or the box-office results. Brilliance if you ask me. Also I think this film works best on a T.V., it would never translate well to a big screen. The budget for the film was approx $140.000 (US) and to be honest you could have fooled me. Let's just say if a US studio had made this film it would have cost about $45 Million and would have failed miserably, with all the executive notes and other useless input weighing down the process. The Tunnel is about a group of journalists investigating why the New South Wales government decided to abandon a project to recycle water found in the vast abandoned train tunnels beneath Sydney, during a serious drought. Ok I liked this film, while it is not perfect it leaves you on the edge of your seat wanting more. It starts out slow but the it begins to build in tension till you can&apos;t keep your eyes off it. Also I love how it's not what you see that scares you, it's what you don't see.